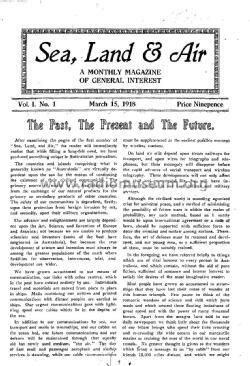 The first issue was on March 15 of 1918. The cover announced that it would be "Describing the Working and Progress of the Navies, Mercantile Marine, Wireless Telegraphy, Wireless Telephony on Land and Sea and Aviation throughout the World and particularly in Australasia." 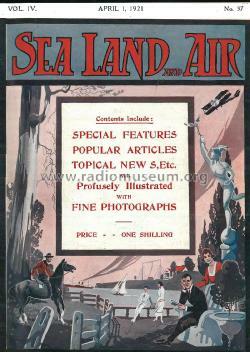 SEA LAND AND AIR was published by the Wireless Press which was owned by AWA. As a consequence Marconi and AWA radio developments featured heavily. This monthly magazine started earlier and survived longer than most, although it did go through name and ownership changes. The first issue was on 15/3/1918, with 72 pages for 9d. Note that in both the book Halcyon Days and the article by Chris Long in Amateur Radio of December 1985 the commencing date is incorrect. The cover announced that it would be "Describing the Working and Progress of the Navies, Mercantile Marine, Wireless Telegraphy, Wireless Telephony on Land and Sea and Aviation throughout the World and particularly in Australasia." SEA LAND AND AIR was published by the Wireless Press which was owned by AWA. As a consequence Marconi and AWA radio developments featured heavily. E.T. 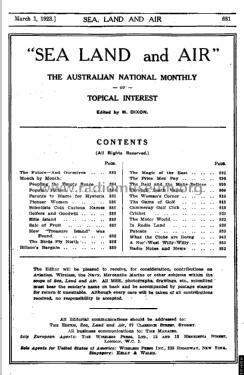 Fisk, the Managing Director of AWA, was also the President of the Wireless Institute of NSW and both he and this magazine had a strong influence on the WIA and the re-commencement of amateur activities after World War 1. At the suggestion of Fisk it was decided to "link up all the experimental associations throughout the Commonwealth with the object of forming an all-Australian Association....". No doubt it was Fisk's influence that saw SEA LAND AND AIR chosen as the "Official Journal of the Wireless Institute of NSW" in March 1919 and then it became the official journal of the Victorian Wireless Institute from the issue of June, 1919, (Vol.2 No.15). Notice that whilst the magazine started a new volume after each 12 issues, the issue number was consecutive from No.1 onwards. There was no issue for October 18, 1918 so that the issues from November, 1918 on could be issued on the first of each month. From July 1919 the number of pages was increased to 80. The Wireless Institute of South Australia was formed in September, 1919, and adopted SEA LAND AND AIR magazine as its journal. In November, 1919, the Wireless Institute of Australia, W.A. Section was set up and chose SEA LAND AND AIR as its journal. SEA LAND AND AIR spread its influence further by becoming the official organ of the Wireless Society of New Zealand with the December 1919 issue. 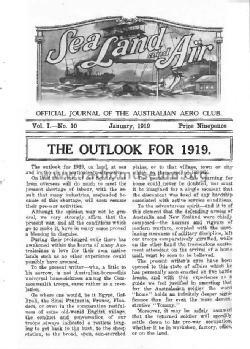 The Wireless Institute of Queensland had formed in March 1919 and later adopted SEA LAND AND AIR as its magazine too, so it had now become the "Official Journal of the Wireless Institute of Australia", a title that it held till October 1923.